Thanks to the nice people from Tagman Press today I received my Advance Reading Copy of Margit Sandemo's "Spellbound". 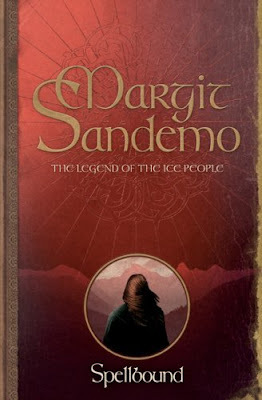 Margit Sandemo is a norwegian-swedish author and she writes historical fantasy. "Spellbound" is the first book in the serie "The Legend of the Ice People", a serie that has 47 books, the first one published in 1982, and that became a best-selling serie in Scandinavia. The book will be published in english now and is due to be released on june 2008 in the UK. So I'm really looking forward for this read. It's kind of amusing that both of the books you've received have oddly similar colours/layouts and authors with the same initials. It must be fate!